Recently, there is finally discussion in Toronto about the Yellow Belt. This brilliant term was coined by Urban Planner Gil Meslin in 2016 to liken the severe restrictions on development in most of the area of the GTA, in all areas designated as “neighbourhoods” (coloured in yellow in the municipal official plans), to the restrictions on development in the actual Green Belt at the edge of the region. How the Yellow Belt Came to Be? 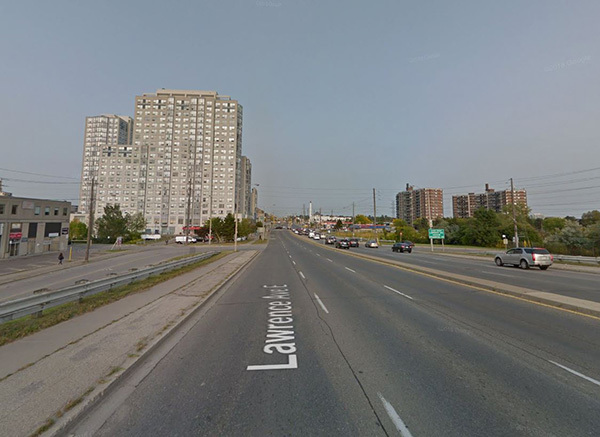 In the 1940s and the following decades, there’s been a strong desire by the city to rebuild the old parts of Toronto into “modern” neighbourhoods (the infamous “urban renewal”), similar to the then celebrated Regent Park and Don Mills. Since demolishing existing neighbourhoods was economically impractical, and since the city had huge areas of farmland to expand into, only in a few occasions did these plans materialize, for example in St. James Town and in Regent Park, but the poor results and anger at the uprooting of the previous residents caused a big public backlash. Luckily, the danger for massive urban renewal has been completely eliminated by the 1970’s, but with it went the ability to add density in all but a few locations. The popular demand for local control, together with the contemporary desire in North America to filter out a variety of “undesirable” people, paved the way to granting local communities immense power over development. The cities collaborated and helped crystallize in time whatever already existed by using zoning and later Official Plans. How does the Yellow Belt Work? 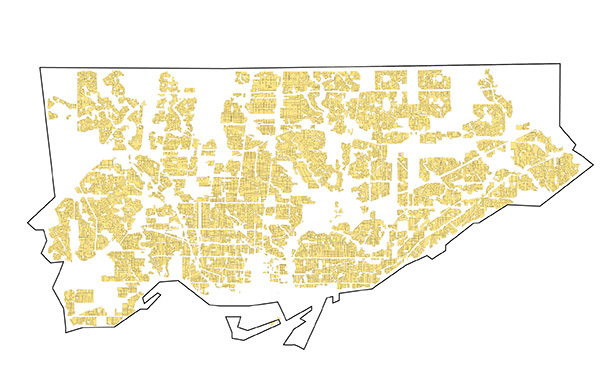 Excluding major streets (which don’t have land use designations), the Yellow Belt covers about 75% of the land area of Toronto. Another 20% are employment areas and open spaces where no residential development is permitted. The city is left with a tiny area where denser residential can happen. Generally, within the yellow belt, it is not allowed to build anything but single family houses on large lots. Theoretical restrictions are much more reasonable, for example in a “Neighbourhood” it is allowed to have small apartment buildings up to 4-storeys high; but in practice, this almost reasonable limit is limited by draconian requirements that new development “fits the character” of the existing context, and in anyway each development application is decided by the community council, whose members represent wards and are by design elected to only represent local interests. In addition to the prohibition on development within the Yellow Belt, there are restrictions on everything within its vicinity. This would not be a big issue by itself, but unfortunately Toronto usually allows intensification only on lots that face arterial streets, often within otherwise “neighbourhood” zones; and this proximity limits the development on these sites by extensive means such as angular planes, limits on shadows, and general requirements for “appropriate transition to the neighbourhood”. There are a few ways how the protections of the Yellow Belt are making housing very expensive. The most obvious way is that the Yellow Belt is a huge land mass where it impossible to add any new housing for people. In fact, many parts are losing people because families are becoming smaller or since neighbourhoods are not affordable for families with children. The Yellow Belt also raises housing prices by pushing construction costs up. Since it is only possible to build in the small area outside the yellow zone, these areas are seeing huge development pressure which leads to mid-and high-rise construction. This type of construction is much more expensive than low rise buildings: mid- and high-rise buildings cost at least $300 per square foot to build, compared to $100-$200 per square foot for low rise houses and apartments. This difference in construction costs is one significant factor in explaining why the Montreal area, where most of the new development is low-rise apartments and houses, is much more affordable than the GTA. In addition to directly raising housing prices, the Yellow Belt decreases mobility within the region. First of all, it occupies most of the central area of Toronto which has easy access to the core by walking, cycling or short transit rides, and this forces many to live further. This is very important since the downtown is the dominant employment centre and it is becoming even more dominant with construction of more offices and with many firms looking to relocate there from other locations. 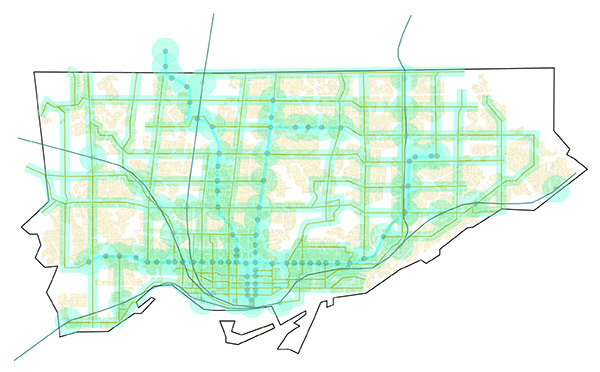 More importantly, the Yellow Belt occupies most of the areas that are close to transit in Toronto and in the region, limiting development in these key areas, forcing people to own cars and use them for their daily needs. Of course, when we make so many people to live in areas with poor transit, it is not just poor choice because we waste their time and money, but this is also impact everyone else since it increase congestion and pollution. Because higher densities allow more people to live on the same amount of land, our default choice should be to allow density in more desirable area, since that would allow more people to live in such areas. This is especially true since in a vast metro area like the GTA, very little of the area can be in the more desirable areas: only about 3% of the GTA area is within walking or cycling distance to downtown; only a small fraction of the rest of the area can be within short walking distance from rapid transit, and it won’t change much even after big infrastructure projects are completed; there are only a few walkable commercial streets, and there is a limit of how many new ones can survive in the overall low density of our region; and, there are only a few attractive natural features like the waterfront or exceptional city parks like High Park. Altogether, maybe 10% of the area in the region is in these preferred locations. But there are many more than 10% of the population for whom location is more important than living in a single family house. Allowing these areas to grow is what we should have been doing, but to a large extent we’ve been doing the opposite. Beside a few sites left over in downtown, we only allow new dense development where it’s politically easy, on multi-lane arterial streets and next to expressways. In fact, we’ve been doing that since the 1960’s. Given the affordability crisis it is better than doing nothing, but it’s also not a way to build a great city, since we’re sending massive amounts of people to live in the worst areas. We are in a mess, but there is another way. This way acknowledges that people who live in single family houses are not entitled for better protections than people who live in apartments, and that in any that dense development does not automatically “destroy the neighbourhood”; and that when we invest public money in infrastructure and improvements to create better areas, by default we should allow more people to live in those areas. We also need to have some historical perspective. Toronto is a young city, and almost every building is the first building that was built on its lot: outside the downtown core, the city lacks the rich layers of history common to older places, where buildings have been replaced many times as the cities grew and changed. 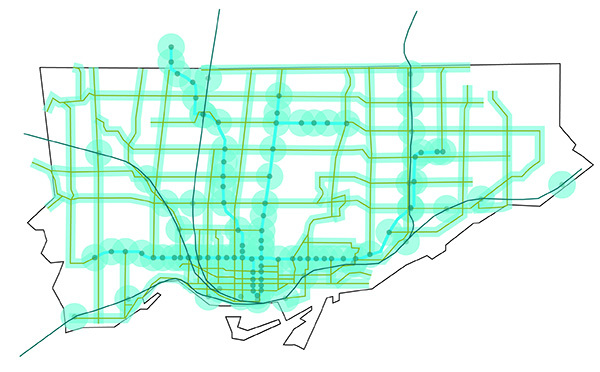 This makes it hard to accept change, but is inevitable if we assume Toronto has many more centuries to thrive. It is time to bring this process into Toronto. We should allow more people to live in areas that are centrally located, served by good transit, and have good amenities.